Mumbai : Towards the mission of ‘Housing for All’, the Government of Maharashtra is aggressively working to fulfill its target of 10 lakh affordable houses in Mumbai Metropolitan Region by 2022. 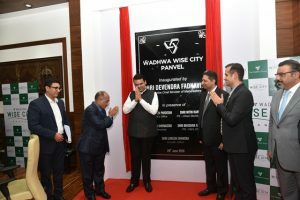 With a view to support this initiative, Shri Devendra Fadnavis, Chief Minister of Maharashtra, yesterday, inaugurated the first Integrated Township Project in NAINA (Navi Mumbai Airport Influence Notified Area) at Panvel. Called as ‘Wadhwa Wise City’, this mega project, which will qualify for Pradhan Mantri Awas Yojana (Urban) Scheme, will open up 5500 affordable homes and will be developed by one of Mumbai’s leading developers, The Wadhwa Group. The project saw a huge response with 900 units sold during the pre-launch phase itself, out of 1500 units that are currently opened for bookings. Most of the customers are first time home buyers and salaried – class who are applying for home loan. The project will make Panvel as the most sought after region for affordable housing.